“A sigh of love for God is worth more than a whole year of penance.” (i.e. penance performed habitually or in our own will). “Ask of me whatever you desire, and it will be procured for you. Strictly speaking, God does not get “angry”; this is anthropomorphic language. The Divine Nature, writes St. John Chrysostom, is passionless. God’s anger is nothing other than an infinite hatred of sin. If His hatred of sin were not so great, this would be a sign of imperfection, not goodness. When God punishes, He does so because He must. God’s punishments are intended to be medicinal. “Benigna must let Me correct her,” said Jesus to Sr. Jeanne Benigne Gojos, “because I love her and I am severe with My dearest spouses as long as they live.” (God’s corrections are evidence of His love for us; all the Saints experienced these loving reproofs). Below is an incomplete list of mystics whose writings have, at the very least, received the imprimatur. Priests have a sublime vocation. They are called to be “other Christs” in a very special way. Without them, there would be no Sacraments, which are for the faithful, a perpetual source of grace, hope and sanctity. No priest = no Mass; and the Mass is the greatest gift that we can offer to Almighty God! Today, perhaps more than ever, priests need our prayers. Many churches are close to empty; priests are mocked and ridiculed by the media and by countless individuals; many Catholics dissent from the Church’s teaching; and there is a tidal wave of liberal theology and modernism that has infiltrated our seminaries. These are just some of the difficulties facing priests today. St. Thomas, along with St. Alphonsus and many others, teaches that a religious is bound to strive for perfection, under pain of mortal sin. It is especially incumbent upon us, then, to pray for priests, that they might fulfil their priestly duties. By praying and offering sacrifices to God that He might give us holy priests, we are exercising the virtues of faith, hope and love; we are demonstrating mercy, which will attract many graces from God, both now and at the final judgement; we are contributing towards the salvation of our own soul, as well as the souls of our brothers and sisters; we are making God better known and better loved; and we are fulfilling one of our many grave duties as children of the Most High. Know for certain that those who disrespect priests, disrespect Christ; and those who love priests, love Christ. The Eucharist (part 2): The Eucharist in the Lives of 101 Mystics! This article will take a look at the Eucharist in relation to Catholic mystics – many of whom were Saints – as they often had profound experiences of Our Eucharistic Lord, and their lives were (and are) a powerful testimony to the Real Presence. Below is a list (which is by no means exhaustive) of Saints (St.), Blesseds (Bl. ), Venerables (Ven. ), Servants of God, and other mystics who have had what can be called “mystical” experiences involving the Adorable Eucharist. One mystical experience has been listed for each individual (such as a revelation, a vision etc.). 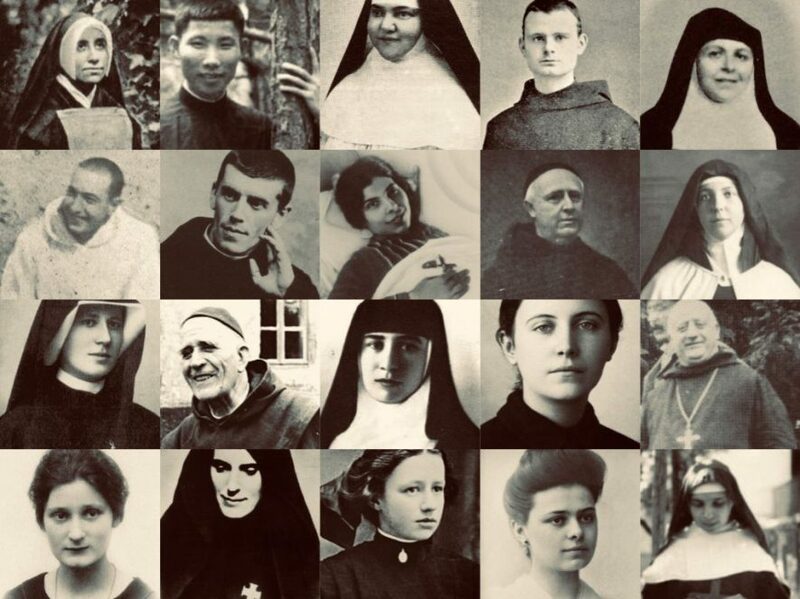 The list consists of 56 canonized Saints, 20 Blesseds, 3 Venerables, 8 Servants of God, and 14 other Mystics, some of whom might be Servants of God or otherwise; though I cannot say with certainty. That makes for a total of 101 mystics (the number is unintentional). 1. St. Secondo (d. 119): Before dying, he received Communion from a dove. 3. St. John Chrysostom (d. 407): He also witnessed angels in the form of humans, adoring Our Lord at Mass. 5. St. Ita (d. 570): On one occasion she prayed that she might receive the Holy Eucharist from a worthy priest. She was then transported miraculously by an angel to a certain location in which a holy priest gave her the Sacred Host. 6. St. Gregory the Great, Pope (d. 604): One day, while he was distributing Holy Communion, he witnessed a woman laughing. He questioned her as to why she was acting so inappropriately, and she confessed that she could not possibly believe that the bread she brought to be consecrated (an ancient practice) could become the Body and Blood of Our Lord. After praying to Almighty God that the woman might be illuminated, St. Gregory observed that part of the “bread” became Flesh and Blood. The woman, who had now fallen to her knees, began to cry tears of repentance. 7. St. Egidio (d. c. 710): During Mass, an angel appeared to him. The angel was holding a book in which was written the sin of a man who wished at that time to be absolved of his sins. His wish was fulfilled by virtue of the Eucharistic sacrifice. 12. St. Bernard of Clairvaux (d. 1153): He exorcised a possessed woman with the Blessed Sacrament. 15. St. Lutgarde of Aywieres (d. 1246): She lived on nothing but bread and weak beer (the usual drink at her convent, perhaps due to poor water quality) for the period of three seven–year fasts – two of which were instigated by Jesus. 16. St. Juliana of Cornillon (d. 1260): “At the age of 16, she had a vision of the Church under the full moon with a dark spot on it. She was given to understand that the spot signified the absence of a special feast in honour of the Blessed Sacrament. 17. St. Bonaventure (d. 1274): He received Communion from the hand of an angel. 22. St. Agnes Segni (d. 1317): She received Communion from an angel on a number of occasions. 23. St. Juliana Falconieri (d. 1341): Before her death, she asked that the Blessed Sacrament be placed on her chest (near her heart). As she began to pray, the Sacred Host disappeared and left a violet–coloured mark on her chest. 25. St. Catherine of Siena (d. 1380): As she beheld the Sacred Host in the hands of a priest, she no longer saw the Eucharistic accidents but the Infant Jesus. 27. St. Frances of Rome (d. 1440): She beheld a magnificent light radiating from the Monstrance in which the Blessed Sacrament was reserved. 29. St. Rita of Cascia (d. 1456): For the last four years of her life, she subsisted almost entirely on the Eucharist. 31. St. Nicholas von Flue (d. 1487): He lived on the Eucharist alone for 20yrs, until his death. 32. St. Columba of Rieti (d. 1501): She fell into great weaknesses when she did not receive the Eucharist, as if to indicate her total dependence on Jesus Christ, the Life of her soul. 33. St. Catherine of Genoa (d. 1510): Throughout Advent and Lent, she lived on the Eucharist alone. 34. St. Peter of Alacantara (d. 1562): He was a confidante of the great St. Teresa of Avila. It was quite common for him to eat only once every three days. Furthermore, he sometimes went a week without food, drawing, as it were, all his strength from the Holy Eucharist. Subsequently, he had little need for sleep; he slept for about one and a half hours every night for forty years. 38. St. Felix of Cantalice (d. 1587): Angels took his place working in the fields when he attended Mass. 39. St. Germaine Cousin (d. 1589): She was once prevented from attending Mass, due to heavy rain that had made a particular stream too violent to cross. But this did not stop her. She prayed, making the sign of the Cross, and the stream parted, thus allowing her to attend Mass. The same miracle was repeated on her way home. 45. St. Thomas of Cori (d. 1729): On a number of occasions, during Mass, he had apparitions of the Child Jesus. 46. St. Lucia Filippini (d. 1732): In response to her ardent desire to receive the Adorable Eucharist, Our Lord ordained that a fragment of the Host would leave the Priest’s hands one day during Mass, and fly to the saint, where It rested on her tongue. 49. St. Gerard Majella (d. 1755): Inflamed with love for Our Lord, little Gerard, aged 8, longed to receive Jesus in the Blessed Sacrament. Unable to do so, due to the custom that prevailed at the time, he was greatly afflicted. But God heard his loving lamentations and sent St. Michael the Archangel to him with the Holy Eucharist, which the angel placed on his tongue, to Gerard’s astonishment and delight. 51. St. Maria Francesco of the Five Wounds (d. 1791): She received Holy Communion from her guardian angel on several occasions. 52. St. Anthony Mary Claret (d. 1870): Our Lord truly abided in Him; he retained the Eucharist in his breast. 54. St. Gemma Galgani (d. 1903): She ate nothing, save for the Blessed Sacrament, between the period of June, 1902, and her death on April 11, 1903. 55. St. Faustina (d. 1938): “Oh, how painful it is to Me that souls so seldom unite themselves to Me in Holy Communion. I wait for souls, and they are indifferent toward Me. I love them tenderly and sincerely, and they distrust Me. I want to lavish My graces on them, and they do not want to accept them. They treat Me as a dead object, whereas My Heart is full of love and mercy.” (Jesus to St. Faustina). 57. Bl. Alpais (d. 1211): She was a poor peasant girl who was nourished by the Eucharist alone for 10 years. 59. Bl. James of Montieri (d. 1289): Jesus Himself brought him the Holy Eucharist on a number of occasions. 60. Bl. Angela of Foligno (d. 1309): She lived on the Eucharist alone for 12 years. 61. Bl. Emilia Bicchieri (d. 1314): One day, while she was busy looking after a fellow sister in religion, she accidentally missed the majority of the Mass. She arrived after Holy Communion and was very upset at being deprived of this precious Gift. In His immense kindness, Almighty God allowed her to receive the Holy Eucharist from an angel. 62. Bl. Imelda Lambertini (d. 1333): From a young age, Imelda had a great desire to receive Our Lord in Holy Communion, but she was all too aware that, due to the custom at the time, she could not do so until she was 14 years old. “Tell me,” she said; “can anyone receive Jesus into his heart and not die?” These words were to be prophetic. On May 12, 1333, Imelda, aged 11, approached the priest for Holy Communion, hoping that she might receive the Love of her heart. The priest ignored her until he saw a Host, radiant with light, ascend into the air and stop right in front of Imelda. Taking this a sign from God, the priest gave her Holy Communion, after which she experienced a state of ecstasy so profound that she died of joy. Her body, like that of so many other Saints, remains incorrupt to this day. 64. Bl. Elizabeth the Good (d. 1420): She lived on the Eucharist alone for 3 years. 66. Bl. Catherine of Racconigi (d. 1547): She was a stigmatist who lived on the Eucharist alone for 10yrs. 67. Bl. Mary Anne De Paredes (d. 1645): She was known to have scarcely taken an ounce of bread every 8 – 10 days. Her only food intake was Holy Communion each morning. 68. Bl. Anne Catherine Emmerich (d. 1824): She lived on the Eucharist alone for 12yrs. 72. Bl. Mary of the Passion (d. 1912): Like St. Benedict and others, she levitated after receiving Holy Communion. 80. Servant of God, Domenica Lazerri (d. 1848): She lived on the Eucharist alone for 12 yrs. 81. Servant of God, Anne-Louise Lateau (d. 1883): She lived on the Eucharist alone for 12 yrs. 85. Servant of God, Edvige Carboni (d. 1952): She received Holy Communion from Our Lord Himself, as well as from several Saints, including St. John Bosco and his humble student, St. Dominic Savio. 86. Servant of God, Teresa Neumann (Servant of God, d. 1962): She received Holy Communion from Jesus. 87. Servant of God, Marthe Robin (d. 1981): She lived on the Eucharist alone for 53yrs. She was instrumental in founding the ‘Foyers of Charity,’ which are spread throughout the world. 96. Maria Von Morl (d. 1868): She had mystical knowledge of the presence of Our Lord in the Holy Eucharist; she knew when her divine Spouse was nearby. 98. Little Nellie of Holy God (d. 1908): She was only a small child, yet she had a great thirst for the Holy Eucharist, and she sensed the presence of Jesus in the Blessed Sacrament. 100. Rosalie Put (d. 1919): Although she was bedridden for 25 years, and therefore unable to attend Holy Mass, she was brought the Holy Eucharist every night by an Archangel. St. Tarsicius, St. Nicolas Pieck, and St. Peter Maldonado, “martyrs of the Eucharist”, pray for us, that we might offer our lives to Love and for Love. Our Lady, Tabernacle of the Most High, pray for us, that we might become living tabernacles of the Most Blessed Trinity.